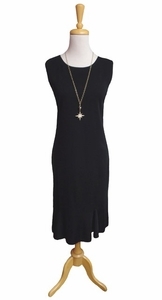 Ming Wang 40" Long Crew Neck Black Tank Dress With Flounce Hem. Fabric 100% Acrylic. Machine Wash Delicate Or Hand Wash.